The 3D Additivist Cookbook, devised and edited by Morehshin Allahyari and Daniel Rourke, is a compendium of imaginative, provocative works from over 100 world-leading artists, activists and theorists. 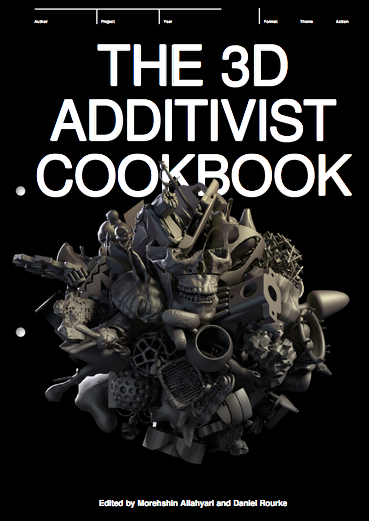 The 3D Additivist Cookbook contains 3D .obj and .stl files, critical texts, templates, recipes, (im)practical designs and methodologies for living in this most contradictory of times. In March 2015 Allahyari and Rourke released The 3D Additivist Manifesto, a call to push creative technologies to their absolute limits and beyond into the realm of the speculative, the provocative and the weird. The 3D Additivist Cookbook is composed of responses to that call, an extensive catalog of digital forms, material actions, and post-humanist methodologies and impressions. #Additivism is a portmanteau of additive and activism: a movement concerned with critiquing ‘radical’ new technologies in fablabs, workshops, and classrooms; at social, ecological, and global scales. The 3D Additivist Cookbook questions whether it’s possible to change the world without also changing ourselves, and what the implications are of taking a position. The 3D Additivist Cookbook (3DPDF / 460mb) is available to download for free in 3DPDF format. The 3D Additivist Archive (torrent / 6gb) contains 3D .obj and .stl files, templates, toolkits, and (im)practical designs for living in this most contradictory of times. About the publication: The 3D Additivist Cookbook was designed with The Laboratory of Manuel Bürger (Manuel Bürger, Simon Schindele and Alexander Papoli), and is published by the Institute of Network Cultures (Amsterdam) as a 3D PDF and print-on-demand publication. The Cookbook was produced as part of transmediale 2016’s Vilém Flusser Residency Programme for Artistic Research with support from the Ernst Schering Foundation (Berlin) (transmediale is a project of Kulturprojekte Berlin GmbH in cooperation with the Haus der Kulturen der Welt funded by the German Federal Cultural Foundation). The #Additivism project was also realised with the support of Autodesk/Pier 9 (San Francisco), Colab at the Auckland University of Technology, Emergent Digital Practices program at the University of Denver, Frank-Ratchye STUDIO for Creative Inquiry at Carnegie Mellon University + VIA Festival (Pittsburgh), Jeu de Paume + Disnovation.net (Paris). With editorial support from Rita Macedo, Shane O’Shea and Miriam Rasch. Contributors include: Nora Al-Badri, Morehshin Allahyari, Kayla Anderson, Nadav Assor, Dom Barra, Andrew Blanton, Body and Swine, Marija Bozinovska Jones, Tom Burtonwood, Bryan Cera, Symrin Chawla, Simon Clark, Christopher Coleman, Katy Connor, Luigi Console, Heather Davis, Julien Deswaef, Laura Devendorf, Heather Dewey-Hagborg, Debbie Ding, Cathrine Disney, Ami Drach, Antonio Esparza, Behnaz Farahi, Jason Ferguson, Matthew Plummer Fernandez, Vilem Flusser, Dov Ganchrow, Urs Gaudenz, Carl Gent, Mandi Goodier, Anna Greenspan, Ben Grosser, Brittany Ransom, Keeley Haftner, Ryan Hammond, Julian Hanna, Claudia Hart, Norman Hogg, Joey Holder, Matthew Hollings, Sophie Hoyle, Sha Hwang, Amy Ireland, The Speculative Prototyping Lab, University of California, Irvine (special thanks to Jesse Jackson), Geraldine Juárez, Kanyaphorn Kaewprasert, Sophie Kahn, Samy Kamkar, Michelle Kasprzak, Katie Kaulbach, Scott Kildall, Corinna Kirsch, Danica Korošec, Kuang-Yi Ku, Darlene Farris-LaBar, Tom Lauerman, Mark Leckey, Golan Levin, Patrick Lichty, Suzanne Livingston, Cat Mazza, Emma McCormick-Goodhart, Kyle McDonald, Shane Mecklenburger, Jasper Meiners, Rosa Menkman, Gabriel Menotti, Nano Entity Collective, Shushana Tesfuzigta, Jan Nikolai Nelles, Henrik Nieratschker, Nicholas O’Brien, Nora O’Murchú, Isabel Paehr, Vimal Patel, Everardo Reyes-Garcia, Zach Rispoli, Patrick Romeo, Adam Rothstein, Daniel Rourke, Dorothy Santos, Gaia Scagnetti, Dylan Schenker, Catherine Scott, Leo Selvaggio, Léo Sexer, Fahmy Shahin, Hua Shu, Germán Sierra, Shawn Sims, Paul Soulellis, Daniel Temkin, Ben Valentine, Elia Vargas, Alan Warburton, Timothy Weaver, Patrick Whitmarsh, Woelab-Lomé (special thanks to Sename Koffi Agbodjinou), Belen Zahera, Alison Bennett (with Mark Payne, Jacki Hammer and Megan Beckwith), ARTEKLAB (Jaime de los Ríos, Daniel Tirado, Enrique Sancho and Saul, Ibon Gurrutxaga), print-green.org (Tina Zidanšek, Maja Petek, Urška Skaza and Simon Tržan) Browntourage (Tonia Beglari, Hawa Arsala) with Lishan Amde, Sofía Córdova, Biayna Bogosian and Emilia Yang, A Parede (Pedro Oliveira, Luiza Prado) with Fannie Sosa, Lucas Odahara and Tabita Rezaire.